Save time with Auto Post queues. Your posts will automatically get published without the need of manual scheduling! Choose to recycle your best performing posts or publish them once. Using Auto Post with queues is a great way to boost social traffic to your website and increase engagement. You will never run out of content! eClincher Auto Post allows you to recycle content with queues. So, what exactly does recycle content with queues mean? Queues represent categories of content per each specific social network. Each queue contains many posts. In our Auto Post, you will need to set up queues with content, and set up a daily publishing schedule for each social profile or page. For example: your Facebook company page is set to publish on Monday at 8:30am, 11:25am, and 6pm. When Monday 8:30am arrives, post number 1 in your Facebook queue will get published. At 11:25am post number 2 will get published, and so forth. After the last post in your queue was published, the queue will start over – post number 1 will be the next post to publish. End-date queue – recycle your queue content until a specified end date (great for campaigns). Don’t let your content go to waste. Each queue can be shared by multiple social profiles or pages. 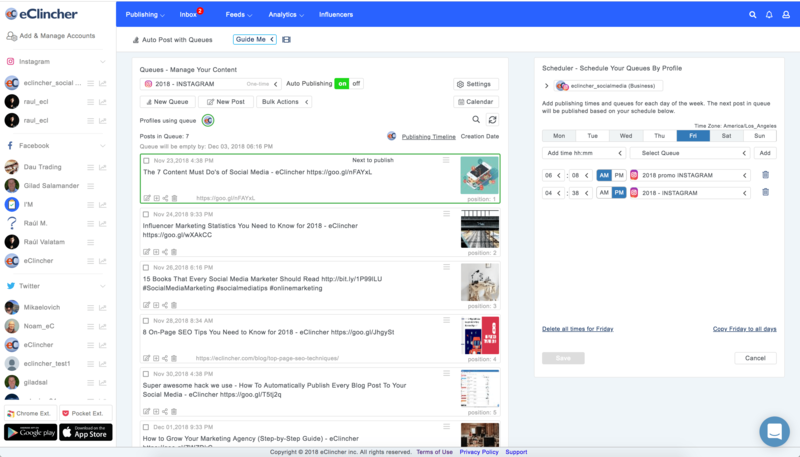 Create queues for each category of posts and automate your social updates – evergreen content, articles, blogs, news, product updates, etc. Use Bulk Upload to quickly upload hundreds of posts, or create new posts. Your content will automatically get published on a daily schedule. Instead of posting your content once and then never using it again, the auto-publishing will automatically post your content and recycle it! Shuffle and Copy Posts: you can easily shuffle your posts in each queue so your content looks more fresh. Also, copy posts to other queues, or save them to a draft library. View queue calendar to see your entire week’s schedule. Bulk Upload: You can easily upload posts in bulk. Using a CSV spreadsheet, you can automatically upload hundreds of posts. You can also upload articles from RSS or Atom feeds. This makes uploading content to your Queues and Draft Posts as easy as a click of a button. For more information on Bulk Upload, click here. Stop Wasting Your Content: Most schedulers share your content once and then get rid of it forever. Auto Post saves your content and re-uses it when all new content has been shared. Finally you can stop worrying about running out of content. Your social accounts will always remain active, which allows you to focus on engaging with your community and growing your business. For more information on Auto Post, click here.